As someone who is in the business (okay, hobby) of reviewing movies and being known as a fan of the silver screen, I’m often asked what my favorite film is. Though at times I may wish I could be someone that would say Modern Times, Animal Crackers, Casablanca, The Graduate, The Godfather Part II, or Grease 2 (kidding…or am I?) I always ALWAYS have a one word answer: Jaws. You see, for me the most honest experience at a movie is when I am totally swept into and away with the thrill of it all and thrills is something Jaws has in spades. It’s too smart of a film to be kept inside the monster movie genre and too gung-ho about getting a rise out of its audience to be relegated to mere classic cinema status and put on the shelf with other well-made movies that aren’t nearly as re-watchable. In 2013 Jaws turns 38 and though I’ve lost count over the years I’d bet my viewings of the film number in the triple digits. It’s one of the very few films where I can’t remember the first time I saw it…and that’s saying something because I’m known to have a fairly good memory for when (and where) I’ve seen most moves in my life (go ahead, quiz me!). All I remember is one day Jaws came into my life on a VHS copy and my changed for the better. After that sharks were the #1 obsession of mine and though I wasn’t one of the viewers too scared to go back in the water after (living in a landlocked state will do that to you) I’ll admit to dog paddling a little easier knowing I could see the bottom of whatever body of water I was taking a dip in. Another special memory of Jaws is that shortly after my parents met they saw it at a sold out theater in Iowa. My mom remembers that they had to sit in the front row and she’s had a hard time seeing the film over the years because it scared her so bad. If I could travel back in time I’m not ashamed to admit that attending a screening of Jaws when it was first released in theaters would be one of my top five choices. Luckily, the popularity of the film has guaranteed that some theater will have it on the big screen once or twice a year and I find it hard to resist buying a ticket any time I see one pop up. I love sitting through the film packed in a crowded theater and hearing the screams, laughs, and shrieks that Steven Spielberg’s landmark film can still elicit all these years later. Having seen every documentary and read all the material on the famously shaky making of Jaws in the summer of 1974, there’s not a lot about the film and its production that I don’t know. A greater appreciation for the final product develops every time I hear about the pain of filming at sea and the frustration with a mechanical shark that rarely worked. Still, without these roadblocks I’m not entirely positive that the film would have wound up as fantastically entertaining as it did. Adapted from Peter Benchley’s runaway bestseller by the author and Carl Gottlieb, Universal Studios knew they had the makings of a huge money maker…if only they could assemble the right team to make the film. Enter young director Spielberg (Lincoln, Jurassic Park), fresh from directing The Sugarland Express which was lauded by critics but ignored by audiences. Decidedly green but possessing a crackerjack eye for film technique, Spielberg wasn’t even sure of himself but faced a trial by fire as he and his crew attempted a daring shoot on location in Martha’s Vineyard under the watchful eye of its residents. Originally planned to feature its star (that’d be the shark) much more, when technical difficulties kept the shark in the repair shop, Spielberg filmed as much of the movie as he could that didn’t feature the man-eating fish. Working with an unconventional troupe of actors, Spielberg was forced to get creative when time and budget called for something shark-related to finally be shot. Merely suggesting the presence of the shark for the first half of the film was a high-wire risky move and I’m not sure anyone involved with the movie was sure how it would all turn out. Luckily for the studio, Spielberg, the crew, and the audience it all came together in a film that went down in history as creating the summer blockbuster. 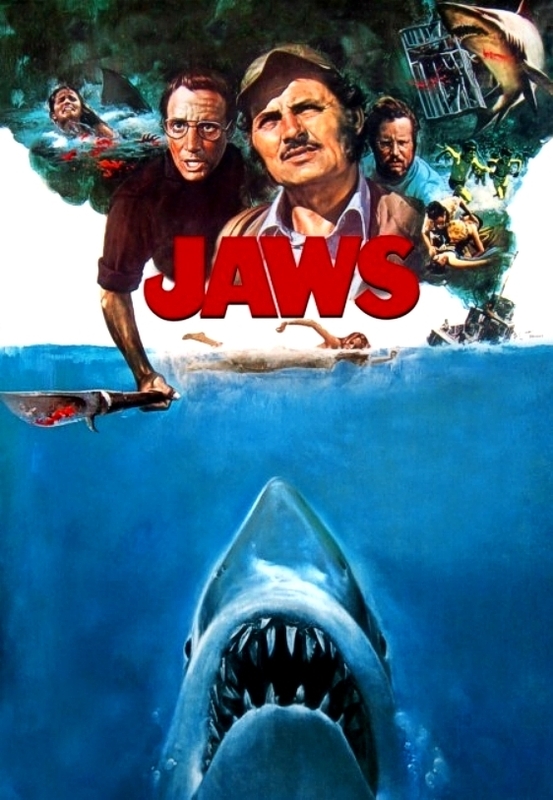 A monster hit when released in the summer of 1975, people waited in line for hours to see the shark do his thing and returned for second and third viewings, propelling the movie into the top box office champ of the year and, for a while, of all time. In fact, in 1975 Jaws made nearly double what the next highest film, One Flew Over the Cuckoo’s Nest, made and it was the first movie to make more than 200 million dollars in the US box office. All the hoopla about making the film and its success aside, let’s not forget that Jaws is one of the most perfectly constructed movies ever put on celluloid. Opening with a bang meant to jolt the audience into rapt attention; the film slowly builds and builds with each new attack more violent and unsettling. Spielberg keeps the tension high as a huge (but not comically proportioned) great white shark descends upon the small New England island town of Amity in the peak of summer. The new police chief Martin Brody (Roy Scheider in a performance that honestly gets better and more satisfying with each viewing) wants to do something about it but a mayor and town council that has their eyes on tourist dollars ignores the problem until it’s too late. Then it’s up to Brody, marine biologist Hooper (Richard Dreyfuss, just a few years before he’d win an Oscar for The Goodbye Girl) and salty man of the sea Quint (Robert Shaw who by some cruel miracle wasn’t even nominated for an Oscar) to set sail in search of the shark…who begins to hunt them as well. While the film could have gone off the rails on any number of occasions, it’s thanks to the three lead performances, Spielberg’s sharp direction, and Verna Field’s Oscar-winning editing that the true beauty of Jaws is revealed. In between passages of breathless energy and suspense, time is taken to let the characters drive the story so we get to know who these people are. That’s why when they find themselves in peril the terror feels even more real because they aren’t just faceless victims ready to be chomped down on…we’ve warmed to them and their squaring off with a very real foe becomes all that more powerful. Though I’ve seen the film numerous times I still find myself having a real reaction to certain sequences in the film. The opening attack on an unknowing swimmer is still unsettling to this day and that Spielberg can stage something so violent without showing a drop of blood and gore is noble. (How this only managed to garner a PG rating is fairly incredible…) I love the interaction Schieder has with Lorriane Gary as his headstrong wife. Even though she was married to the head of Universal Studios and some cried foul, Gary is a commanding presence and makes a believable counterpart to Scheider. Who can forget Shaw’s infamous monologue about the true-life tale sinking of the U.S.S. Indianapolis and all of the men taken by a swarm of hungry sharks? Then there’s the 25 foot shark and his wickedly scary appearances throughout the film; timed so perfectly that you don’t just jump in your chair…you leap out of it. Of course, you can’t mention Jaws without saving some space for John Williams and his Oscar-winning score that is very nearly a character unto itself. Some have said that watching Jaws without the score takes away much of the suspense and I can’t say I totally disagree. Though the shark isn’t seen fully until late in the film, it’s the ominous simple note combination from Williams that tells you danger is near. It’s one of the select film soundtracks that could be heard in its entirety where one can see the movie happening in their head as they listen. I’m always a bit stunned when someone says they haven’t seen Jaws. Then I’m excited because that means when I finally force them to see it they will get to experience filmmaking at its absolute finest. The movie has everything going for it – it’s a scary, funny, well-made, well-acted, carefully stitched together piece of cinema that has kept its dignity over the years though many lesser talents have tried to re-capture some of the magic. Followed by three sequels and inspiring endless rip-offs the movie is still a high water mark for blockbuster entertainment. Happy 38th Birthday Jaws…you still have a lot of bite left in you!